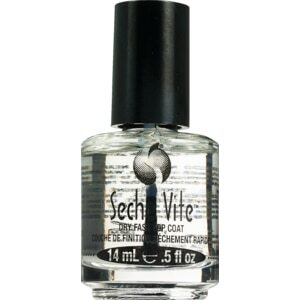 Seche VITE acknowledged as the world's finest top coat. Its patented formula allows it to penetrate through the nail lacquer to the base coat forming a single solid coating over the nail plate for a much more durable finish which is guaranteed not to yellow. Seche VITE is unmatched as a top coat. Your nails will feel silky, be stronger, and will absolutely not chip. Seche VITE creates the highest gloss and is longer lasting than any product on the market today. Apply thickly, get a nice bead on the end of the brush, then set softly down on the first nail painted and watch how Seche VITE flows over the wet nail polish without dragging or streaking the underlying manicure. Made in USA. Butyl Acetate, Toluene, Cellulose Acetate Butyrate, Isopropyl Alcohol, Trimethyl Pentanyl Diisobutyrate, Benzophenone-1. This product contains a chemical known to the state of California to cause birth defects or other reproductive harm. Keep away from heat and flame. Keep out of reach of children.